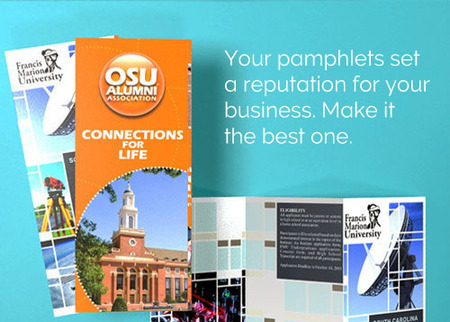 You can create the best pamphlet for your business with the options that fit your message. "PrintPlace has given me the tools for my business that take away the stress of waiting because of the tools they provide online, which in turn speeds up turnaround time for me." Pamphlet printing creates are a valuable tool for any business. They make it easy to share a lot of information and divide it into conveniently readable sections. When you want to share a lot of content, your customers will be more likely to read it when it’s presented in these small chunks. The written words are not the only message pamphlets deliver though. The presentation (the paper stock and coating) speak volumes about your business as well. PrintPlace keeps high quality easy and affordable with online pricing and ordering. We can even mail your pamphlets to your list of recipients if you’d like, or source a mailing list that fits your needs. Questions? Call our friendly print experts with any questions. Follow our pamphlet layout templates below. They will help you check that your artwork fits our printing guidelines. Download the layout templates for the program of your choice: Illustrator, Photoshop, or Publisher. Your custom printed pamphlets are eligible to mail at letter or flat rates, depending on the final/folded dimensions (see “Mailing Requirements” below to set up your pamphlet design for the best postal rates). PrintPlace’s direct mail services include: processing 1 mailing list, duplication removal if requested, CASS Certification, inkjet addressing, and postal presorting for automation rates. Pamphlets, like flyers, are an effective way to provide information for events, services, or even political messages to voters. Pamphlets can even break up information to make it easier to read. Use the cover of your pamphlet to grab the recipient’s attention with colorful images or bold graphics. Keep folding areas in mind when designing so your important text and information can be easily seen. Use headlines and sub-headers to break up text and make it simpler to read.